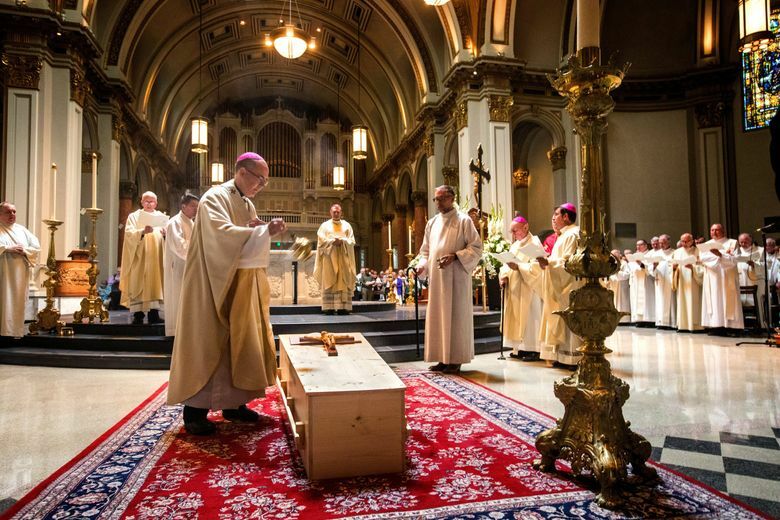 Hundreds of mourners filled St. James Cathedral in Seattle on Wednesday to pay their respects to Archbishop Emeritus Raymond G. Hunthausen, who led the Seattle archdiocese from 1975 to 1991. He died July 22 at age 96. 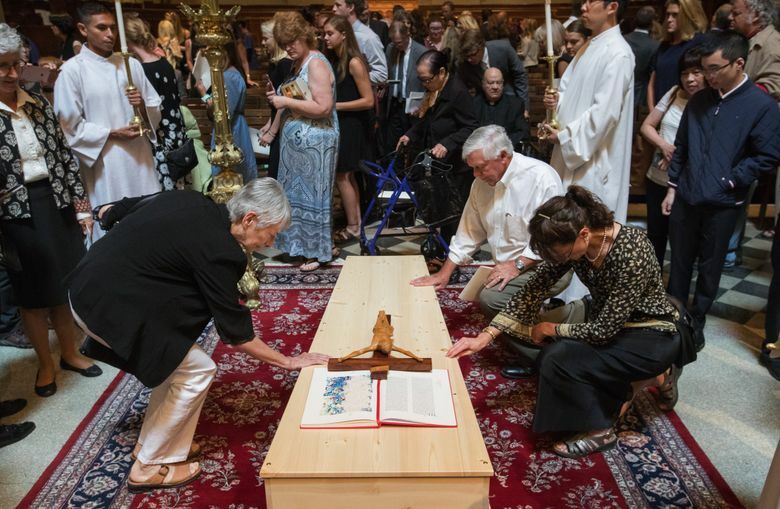 The mourners filled every available space in the pews at St. James Cathedral, and the extra chairs, and the benches alongside the wall. 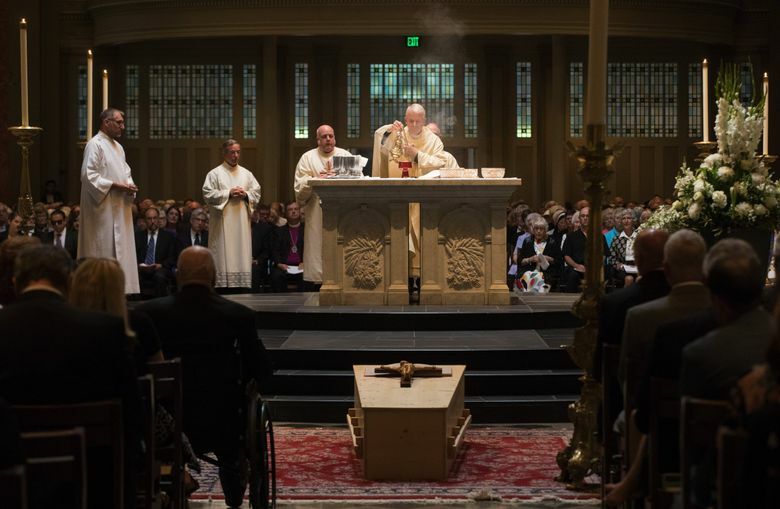 So it would have been more than 1,250 people who Wednesday came to pay their respects at the funeral mass for Archbishop Emeritus Raymond G. Hunthausen, who died July 22 at age 96. Among them was Mercy Lazo, 53, a nurse from Burien. She hadn’t expected so many people to show up. But they did. It has been 27 years since Hunthausen retired and moved back to Montana, his native state. 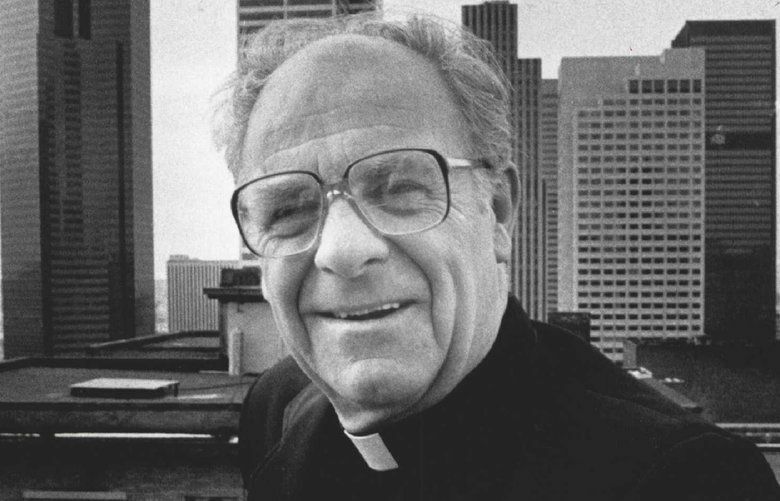 He led the Seattle archdiocese from 1975 to 1991. He died in a nursing facility in Helena, no longer able to read or walk. Lazo had only heard about this man. 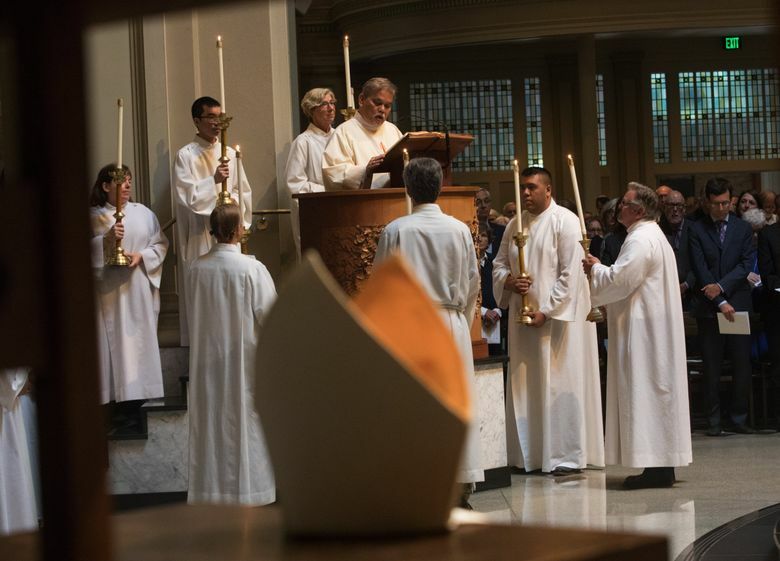 “He brought a lot of lay people into the service,” she said. He was a humble man, she said, and that’s why she was here. Those attending came from all ethnicities; some wore formal dress outfits; some came in summer shorts. Their ages tended to be middle years and above. Those old enough had personal memories of the man. They talked about the archbishop’s causes on behalf of a broader role for women within the church, and for nuclear disarmament. 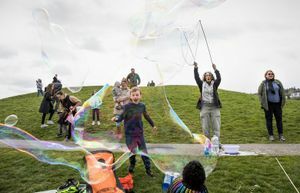 Among the photos displayed at a social event afterwards with snacks was one of the archbishop speaking at a 1982 peace rally near the nuclear-armed Trident submarine base at Bangor. But it was the small moments that many remembered. 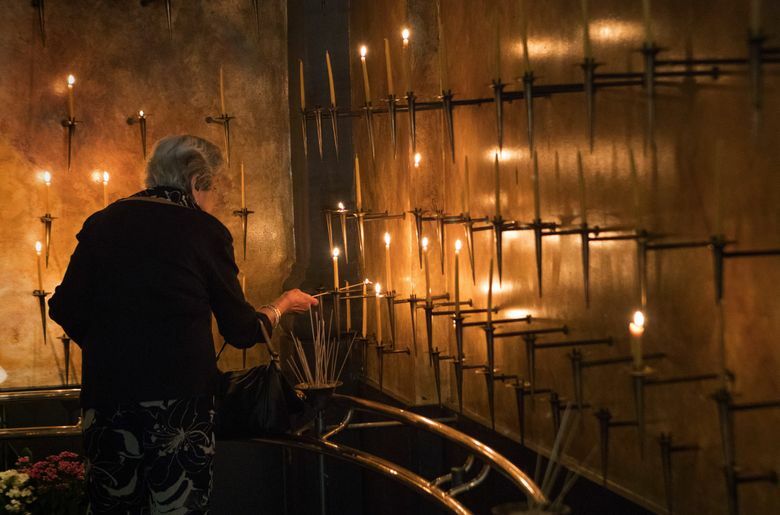 Terry Scheuer, 67, of Kenmore, told of taking his three daughters to his North End parish to meet the by-then retired archbishop, who happened to be visiting. “I told them he had been my spiritual mentor — his humanity and kindness,” remembered Scheuer. Then he told of the small moment he’ll remember. “I’m Ray,” the archbishop insisted, and shook their hands. However, among the stories of the archbishop’s championing of the poor and disenfranchised, there is a cloud. 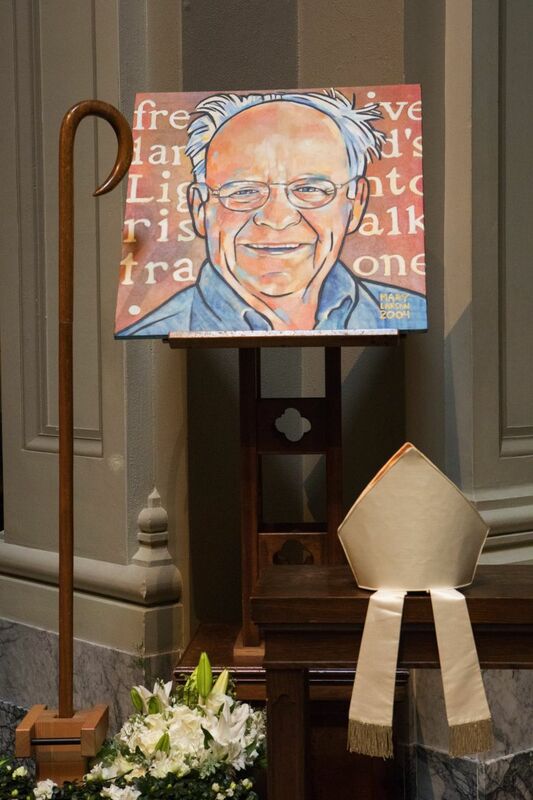 He was criticized by sexual-abuse victims and others who said he knew or should have known about abusive priests and religious-order members during his time heading the Seattle and Helena dioceses. “It broke his heart,” said Scheuer of accusations that he could have or should have done more. The homily on Wednesday was given by Rev. Michael G. Ryan, pastor of the cathedral. Among the many stories he told of “Dutch” — as he was known among his friends — was of “listening sessions” the archdiocese held at various parishes in 1976. Father Ryan was at the one in Bellingham. 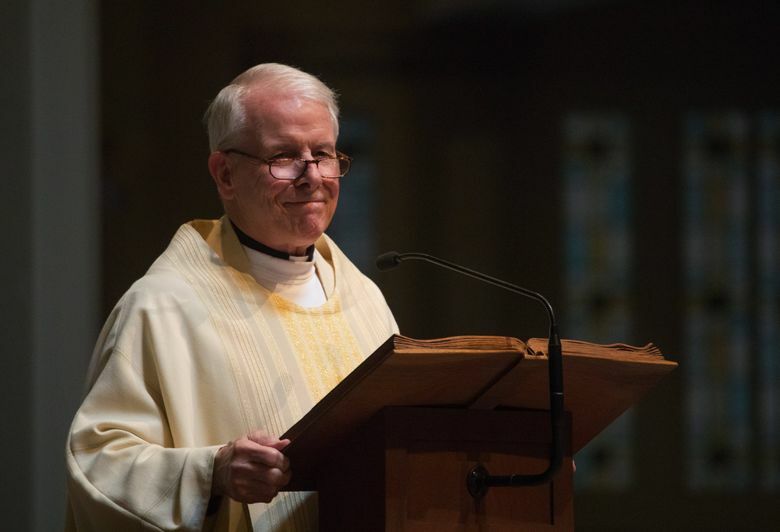 On Tuesday, Bishop Emeritus William S. Skylstad of the Diocese of Spokane gave a homily at a vigil for the archbishop, and he also recounted those personal moments. He told about the archbishop and George Kotolaris, who died 28 years ago in 1990. For years he was known as part of the eccentric son-mother pair of George and Pansy. They were social gadflies and masters at crashing events, whether a press conference, a wedding, or, among their favorites, a funeral. Always with a camera. A devout Catholic, George attended church. Skylstad recalled that Hunthausen, even as archbishop, would sometimes drive George home from various church functions. In 1987, Hunthausen became aware of the almost unlivable conditions inside George’s apartment. The manager had given George ultimatum after ultimatum to clean it or be evicted. George dumped the manager’s memos on Hunthausen’s desk. George collected everything — cake and food from weddings, papers, just plain junk. The manager said he had 60 bags full of dirty clothes, as he never did any laundry. There were rats and cockroaches from spoiled food. 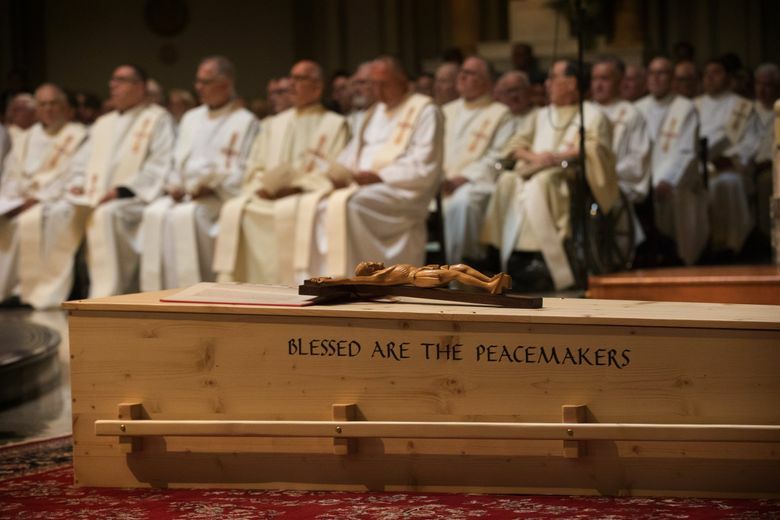 The archdiocese has said Hunthausen was the last living American bishop to have participated in all four sessions of the Second Vatican Council, called by the pope in the early 1960s to modernize the church.